Amaranthine`s Red Rose Arrangement, is a premium display of 12 long stem red roses in a stylish ceramic base. Combined with lush foliages and tropical leaves this display says it all. Created by Amaranthine Flowers By Design, New Lambton, Newcastle. Using 1 dozen red roses, for a romantic statement. Same day delivery available to all areas of Newcastle, Maitland and Lake Macquarie. Including John Hunter Hospital, Charlestown Square, Newcastle Private Hospital, Lake Macquarie Private Hospital, Maitland Hospital and Mater Hospital, six days a week. 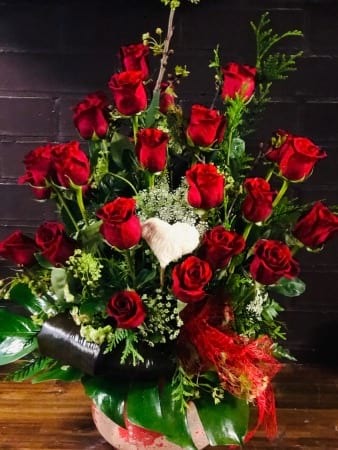 Include a message on our complimentary gift card or enhance your flowers with one of our fantastic add-on gifts, your selection ion of chocolate, wine, bears, balloons or many more.